Haywards Heath owes its existence to the railway. The residents of Cuckfield objected to the Brighton line being routed through it, so it was routed through open country to the east, where there was a station from 1841. The area developed rapidly and in 1865 the parish separated from Cuckfield. A church of some size and dignity was already under way (St Wilfrid), and the town, as it soon became, continued to expand. 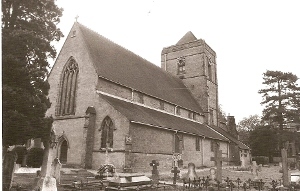 St Richard existed by 1897 and the Church of the Presentation soon afterwards. Since World War II, two more churches (Ascension and Good Shepherd, though the latter has since been demolished) have been added. The town now merges into Cuckfield and Lindfield, though both remain independent parishes.